Book review by Nira Yuval-Davis of Elia Zureik's The Palestinians in Israel. Elia T. Zureik, The Palestinians in Israel: a Study in Internal Colonialism, Routledge and Kegan Paul, London, 1979; 249pp. The Palestinians living in the pre-1967 Israeli borders (currently numbering about half a million people) have been relatively neglected, bòth analytically and politically, in the abundant literature on the Middle East. The few systematic studies that have been written on them mostly approached the issue from an a-historical perspective, either socio-psyschological or socio-anthropological.1 Elia Zureik's book, which broadly uses marxist analytical tools and the model of internal colonialism, therefore constitutes an important contribution on the subject - in spite of the fact that it presents virtually no original research and, more importantly and probably partly as a result of this, in spite of some serious factual and analytical omissions in the book. The most important of these is the absence of any analysis concerning the relationship between the Palestinians living in Israel's pre-1967 borders and the other sections of the Palestinian people, living under Israeli rule (in the occupied territories) and outside it. The best part of the book concerns the analysis of the zionist-Panestinian relationship before the establishment of the State of Israel in 1948. Here Zureik, in the tradition of the analysis developed by the Israeli anti-zionist left,2 claims rightly that one should not, as do too many other studies, analyse the zionist colonisation in Palestine either in terms of a national liberation movement, or as a colonialist movement with goals and practices identical to those of other colonialist endeavours like in Algiers or South Africa. The zionist movement aimed at establishing in Palestine an exclusively Jewish society, and its basic policy towards the Palestinians was that of dispossession - dispossession, which unlike other colonialist endeavours, was not followed by any re-integration in the new economy, even as cheap labour. On the contrary, the zionist struggle aimed at monopolising not only the land, but also production and the labour market. The relationship between the zionist and indigenous sectors in pre-1948 Palestine did not follow the classical model of internal colonialism based on the exploitation of the local population. Rather, there developed a dual Jewish-Palestinian society structure, mediated by the British mandatary power - a duality, however, which did not totally separate the two societies, nor did it signify any kind of symmetric relationship. On the contrary: in this duality, the Jewish-zionist society occupied a dominant place and had a more powerful position than the Palestinian. The dynamics of the development of each sector was greatly dependent, especially on the Palestinian-Arab side, on developments in the other sector. The specific character of political-economic patterns of this dual structure resulted from a combination of factors inherent in the nature of zionist colonisation, the British mandate and Palestinian society, and Zureik analyses briefly some of them. Although one might argue with various specific points in this analysis (e.g. Zureik's treating the 'economic absorptive capacity' of Palestine as if it were a physical quantity not relating to the mode of production) the general approach is both useful and valid. Unfortunately, though, Zureik does not analyse the ways in which this process has taken place beyond making some general comments, mostly based on the study of Rosenfield and Carmi.4 This has left some crucial omissions in the book, of which we shall mention two. First, Zureik does not discuss the practices (as distinct from ideology) by means of which the state attempted for a while to prevent or at least to limit drastically the integration of Israel's Arab population in the post-1948 period. The main mechanism for this - which Zureik does not mention at all - was the military rule5 to which the Arab population was subjected and which restricted its members' movements into the Jewish cities up to 1965. The temptation to exploit the Arabs' labour gradually overcame the desire to isolate them, as the social character of the Israeli society evolved. The military adminstration (but not the emergency regulations on which it was based) was eventually dismantled about two years before the 1967 war and the resulting occupation and internal colonisation of other sectors of the Palestinian population. I have misgivings also about the way Zureik describes the actual process of transformation of the villages. He is not very careful analytically and uses the terms 'proletarisation' and 'transformation into a declasse lumpenproletariat' almost interchangeably. One important aspect in this process which Zureik fails to explain is how it came about that the villagers who went to work in the Jewish cities were given not only the type of jobs nobody else wanted to take, but were also exploited economically more than Jewish workers in the same type of work. This exploitation was due partly to discrimination concerning unionisation (the Histadrut did not accept Arab members until the early 1960s). But there was also another reason: they could be paid wages lower than their reproduction value because, being largely village-based, they were part of the family collective system in the villages, which remained to Some extent outside the capitalist mode of production and served to cushon them against the effects of unstable work and underpaid jobs. The above points relate primarily to the Palestinians who were under Israeli rule in the 1948-67 period. Probably the greatest weakness in Zureik's analysis of the situation of the Palestinians in Israel is that he does not differentiate between their position before and after 1967, and regards 1948 as the only watershed in Palestinian history in general in the 20th century (an oversight which is even worse when one considers other sections of the Palestinian people, who did not come under Israeli rule after 1948, but after 1967, or that remained as refugees outside Israeli control even after 1967, but became associated with the PLO.) This creates some technical problems in the text: in the official Israeli statistics which Zureik uses in his book, other Palestinians, at least those from East Jerusalem, are also included in the post-1967 period, and this must bias data which follow developments among Palestinians in Israel over the years. The problem, however, goes beyond these invalid statistics: although as far as I know a systematic study of the subject is yet to be made, it is quite clear that Israel's occupation of the West Bank and Gaza and its policy of internal colopjalism has also had an economic effect, both direct and indirect, on the Palestinians living inside Israel. Many have become suppliers of goods to the occupied territories; many of the workers have gone up in the occupation scale, in comparison to the Palestinians from the occupied territories; and there is even some evidence that quite a few have become employers of Palestinians from these territories. The extent and specific character of these transformations are still waiting to be studied, but Zureik does not even ask these crucial questions concerning the economic role of the Palestinians in Israel after 1967. The effect of 1967 has not been limited to economic life. It has been even more far-reaching in the cultural and political spheres in the reality of the Palestinians inside Israel. Zureik rightly emphasises that in order to understand relationships of colonisation one must analyse their effects on culture and politics. But one cannot analyse these aspects of post-1967 Israel without recognising the fact that some contact with the Arab world became possible by virtue of the policy of open bridges; and even more importantly, without considering the political effect that the rise of the Palestinian resistance movement has had on the Palestinians in Israel. For instance, Zureik mentions in passing that of the three major Palestinian poets who grew up in Israel, two eventually moved out to work with the PLO. But he does not analyse the political significance of this. Nor does he see in the rise of the Arab nationalist student movement in the 1970s (he does not mention the important movement of the Sons of the Village) anything but a repetition of the al-Ard movement of the early 1960s, and does not take into account the vast difference that the changed political context has made to Palestinian nationalism in Israel. To take the Palestinians who have lived under Israeli rule since 1948 as a unit of analysis separate from other sections of the Palestinian people is not only legitimate but also useful - their history in the last thirty years has been politically, economically and socially different from that of other parts of the Palestinian people, even those who came under direct Israeli control in 1967. However, separation should not mean isolation. In the same way as Zureik insists that one cannot understand the Arab and Jewish societies in pre-1948 Palestin without understanding how each of these societies was affected by their mutual relationship - we must also insist that any valid analysis of the Palestinians in Israel should consider not only their inter-relations with the Israeli Jews but also their relationship to the Arab world in general and the Palestinian resistance movement and the PLO in particular. Not to do so constitutes both an analytical and a political oversight. To sum up: Zureik's book is an important beginning towards the understanding of the Palestinians in Israel. However, especially when it concerns the post-1967 period, this beginning is still far from being a satisfactory comprehensive analysis of this situation. For that we shall have to wait for another book on the subject, perhaps by Zureik himself. One final remark. 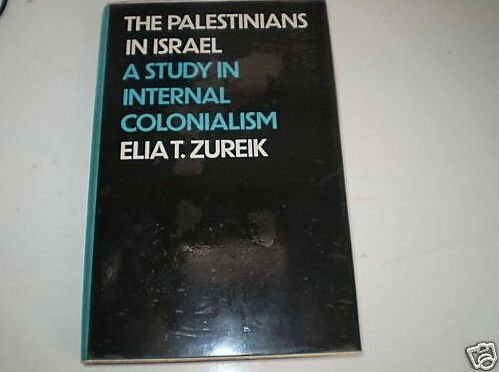 In addition to the specific analysis of the situation of the Palestinians in Israel, Zureik's book also includes review chapters on the model of internal colonialism and on Israeli sociological writings on Israeli Arabs. There is a lot of useful and interesting material summed up here, but one feels the absence of a firm editorial hand, which would have made these chapters more concise and more directly linked with the rest of the book. 1. A useful annotated bibliography of studies on the subject is Sammy Samooha and Ora Cibulski, Social research on Arabs in Israel, Turtledove publications, Israel, 1979. 2. See for example Haim Hanegbi, Moshe Machover and Akiva Orr, 'The class nature of Israel', in New Left Review 65, 1971, pp3 -26. 3. As a typical example of this, Zureik refers to Chaim Adler, 'Social stratification and education in Israel', in Comparative Education Review, vol 18 no 1,1974. But the point is valid for the major part of Israeli sociological writings. 4. H. Rosenfeld and S. Carmi, 'The origins ofthe process of proletarization and urbanization of Arab peasants in Palestine', in Annals of the New York Academy of Sciences, vol 220 no 6,1974, pp470-485. 5. For a detailed discussion of how the military government operated and controlled the Arab population in Israel see Sabri Jiryis, The Arabs in Israel, Monthly Review Press, New York, 1976.